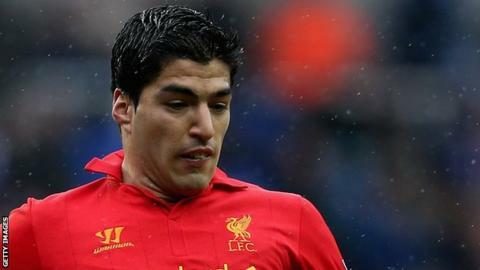 Liverpool striker Luis Suarez says now would be a good time to move, but has made no decision on his future. The 26-year-old, who is serving a ban for biting Chelsea's Branislav Ivanovic, admitted on Wednesday it "would be difficult to say no" to Real Madrid, who have been linked with him. On Thursday he said: "It's a good moment for a change of environment because of all I've been through." He added: "I do not know when I'm going and I do not know if I'm staying." The striker was speaking at a news conference in his homeland ahead of Uruguay's friendly with France in Montevideo on 5 June. Suarez, who was banned for eight games for racially abusing Manchester United's Patrice Evra in 2011, added: "I have only words of thanks to the club, the fans of Liverpool. "But the treatment I received from the rest of England in recent weeks has been tough. "It [Liverpool] is a spectacular club, but they are aware of the way that the press treats me." Suarez joined Liverpool in a £22.7m deal from Ajax in 2011. He scored 30 goals last season but missed the final two games of the campaign after being found guilty of violent conduct for biting Ivanovic in April. Suarez has rejected reports in Spain that he has begun talks with Real but has reiterated his interest in a move to the Bernabeu. He said: "It is normal that it is impossible to say no to big teams for which one always dreams. Yet I have nothing, I have not spoken with Real Madrid nor with Liverpool. "My agent has not told me anything either and that leaves me alone, but they [the media] are speculating. "Every time you do something it becomes big. I just said I'm very happy at Liverpool and I'll be forever grateful to this great city and this club made me grow so much, where I still have a contract."